Our proprietary 220 Gallon Water Tank is perfect for construction sites and new home sales trailers. The water tank system works in conjunction with our waste holding tank and our containment tank to create a fully-functioning work site. This non-potable water tank system prevents freezing to zero degrees and helps your business and staff with uninterrupted service. 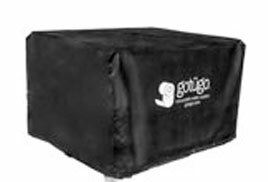 Gotügo’s water tanks are convenient and easy to install, accommodating most plumbing configurations.